Since founding this funeral home in 1994, We have assembled a team of experienced funeral directors...local people with roots in the community. We built a spacious funeral chapel on University Parkway, decorated it tastefully, and completed it with comfortable furnishings and soothing colors. 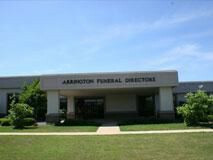 Soon afterward, we installed an on-site crematory and expanded our services to the community. Today, the Arrington Funeral Group serves the families of Jackson and surrounding communities with a complete, comprehensive selection of funeral services. Here, families who are faced with planning a funeral find arrangements that meet every preference and every need.